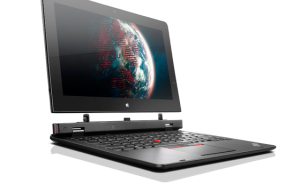 Lenovo has announced the launch of ThinkPad Helix 2, running on Windows 8.1. ThinkPad Helixx 2 is a powerful 2-in-1 ultrabook, comprising unique design, tracking point system and a long battery life, designed essentially for the users looking for a compact device with all required add-ons. The Helix 2 can be grabbed at the starting price of $979 (Rs. 78,000 approx), whereas its predecessor was priced at $1679 when it was first launched. Lenovo ThinkPad Helix 2 is a convertible ultrabook which can be used as a laptop as well as a tablet. To talk about the specs, Helix 2 comes with a 29.46-cm (11.6-inch) IPS display with full HD and (1920×1080 pixels) resolution. It is powered by Intel Core M processor alongside 4GB RAM Intel HD Graphics 5300. As per the company the tablet is capable of serving up to 8 hours of battery life and up to 12 hours of running time, when keyboard dock is connected. It comes with a 2MP front-facing camera and a 5MP HD autofocus rear camera, with 30 fps video recording. On connectivity front, it comes with WiFi, Bluetooth 4.0, USB 3.0 ports, microSD slots, stereo speakers and micro HDMI output options. Further the keyboard dock also involves a USB 2.0 ports and two more speakers. The company has also installed few add-ons security options as well like biometric fingerprint reader, three-factor authentication and a military-grade smart card reader. It also involves pre-loaded apps like SHAREit, SECUREit and SYNCit.